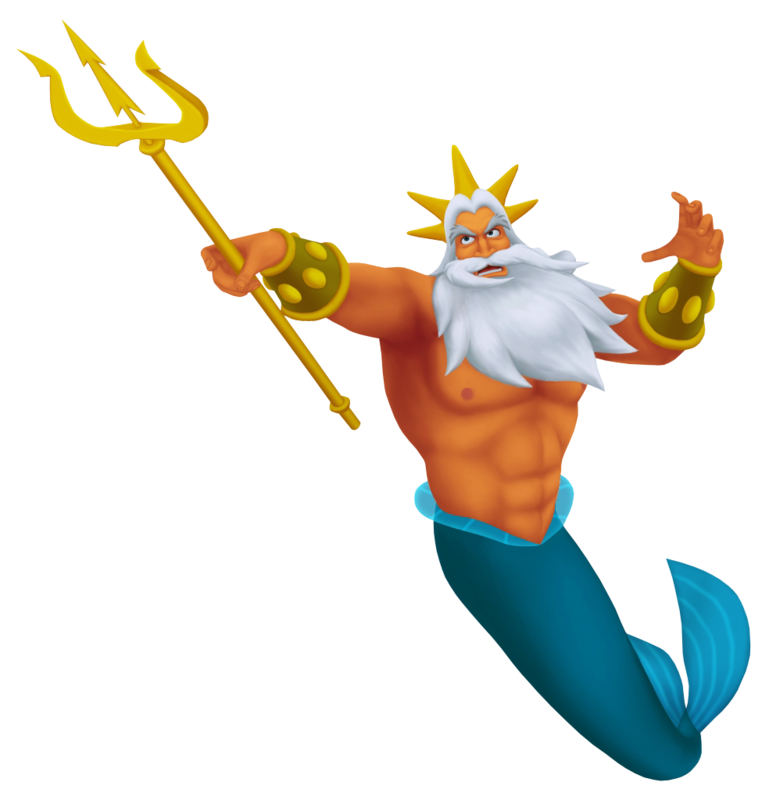 The mighty Sea King of all the oceans, King Triton is backed by the power of his trident, which is instrumental in keeping the Heartless at bay. Though adept at protecting his kingdom from the darkness, King Triton is unable to keep Ariel in check despite his suffocating rules and regulations, and thus has to rely on Sebastian the crab to keep an eye on her. Highly suspicious of outsiders, particularly those bearing the infamous Keyblade, King Triton vehemently denies the existence of the Keyhole and requests for Sora to leave the kingdom. Upon seeing that the trio and Ariel are extremely close to finding the Keyhole, Triton destroys the Crystal Trident in a rage, unknowingly creating a series of events in which his own daughter betrays him and the trident is snatched away by Ursula. Sora, Donald and Goofy eventually earn Triton's favor by restoring the trident to its rightful owner. Though the Sea King allows Sora to seal the Keyhole with his blessing, he gives the trio one final warning: In the wrong hands, the Keyblade can be a weapon of massive destruction. The wise but short-tempered monarch of Atlantica, King Triton is wary of outsiders, but with good reason. The Heartless have more than once created havoc in his palace before, but the power of his trident has kept them at bay. Triton takes advantage of this peaceful reprieve to enjoy Sebastian's concerts, unaware that his own daughter is sinking into depression. Triton's prejudice against humans, lowering them to be nothing more than barbaric fish eaters, surfaces once he discovers that Ariel has fallen in love with one. Determined at all costs to stop the romance, he ruthlessly destroys Ariel's grotto, although this has the reverse effect of pushing her into Ursula's deceitful arms. When Ariel finds herself trapped in her bargain with Ursula, Triton steps in and out of his love for his daughter, selflessly trades places with Ariel, reducing himself to a sea polyp and allowing his crown and trident to fall into Ursula's grasp. His title is restored once the Sea Witch is defeated. He finally overcomes his hatred of humans to allow a relationship between Ariel and Eric, having witnessed the prince's bravery and his acceptance of Ariel's undersea nature. Although he is unaware of it at that time, his warning in Kingdom Hearts about the Keyblade being a weapon of great destruction eerily comes true later in Kingdom Hearts II.